The Journal of Solid State Electrochemistry publishes papers on all aspects of electrochemistry of solid compounds, including experimental and theoretical, basic and applied work. It equally publishes papers on the thermodynamics and kinetics of electrochemical reactions if at least one actively participating phase is solid. Also of interest are articles on the transport of ions and electrons in solids whenever these processes are relevant to electrochemical reactions and on the use of solid-state electrochemical reactions in the analysis of solids and their surfaces. 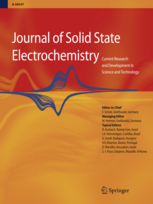 The journal covers solid-state electrochemistry and focusses on the following fields: mechanisms of solid-state electrochemical reactions, semiconductor electrochemistry, electrochemical batteries, accumulators and fuel cells, electrochemical mineral leaching, galvanic metal plating, electrochemical potential memory devices, solid-state electrochemical sensors, ion and electron transport in solid materials and polymers, electrocatalysis, photoelectrochemistry, corrosion of solid materials, solid-state electroanalysis, electrochemical machining of materials, electrochromism and electrochromic devices, new electrochemical solid-state synthesis. The Journal of Solid State Electrochemistry makes the professional in research and industry aware of this swift progress and its importance for future developments and success in the above-mentioned fields.